MARY TILLOTSON: I’m Mary Tillotson. STEVE EMBER: And I’m Steve Ember with the VOA Special English program, PEOPLE IN AMERICA. 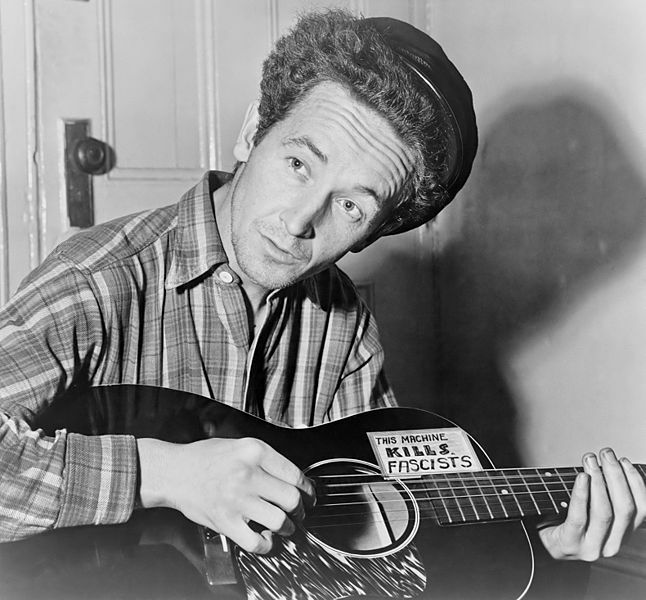 Today, we begin a two-part story about songwriter and singer Woody Guthrie. He wrote songs about common people and social issues in the nineteen thirties. His music influenced many people. MARY TILLOTSON: Imagine you are in America in the nineteen thirties. A train passes through the countryside. It is night time. And the only sound that can be heard is the long, lonely whistle coming from the train’s engine. Inside the train’s boxcars are groups of men sitting or lying on the floors. The men are dirty and their clothing is torn. In one boxcar, a short man with long, curly brown hair is playing a guitar and singing. His name is Woody Guthrie. He is singing a song about men who look for work as they travel from town to town. STEVE EMBER: Woodrow Wilson Guthrie was born in nineteen twelve in the American state of Oklahoma. The Guthrie family lived in a small farming town called Okemah. Woody’s father, Charles, was a businessman who bought and sold land. Woody’s mother, Nora, was a school teacher. She also liked to play the piano and sing. When Woody was young, his mother sang him songs she had learned as a girl. These songs told stories about love and death and difficult times. MARY TILLOTSON: Woody’s early years were happy ones. But his life began to change when he was only ten years old. One day, his sister, Clara, spilled oil on her dress and accidentally set herself on fire. She died the next day. Woody never forgot her death. As time passed, Woody’s mother began acting strangely. She lost control over her actions and speech. Many people thought she was insane. Because of this, the Guthrie family became more private as they attempted to hide Nora’s problems. The loss of his daughter and his wife’s suffering ruined Charles Guthrie. He began drinking alcohol. His business soon failed. The Guthrie family left Okemah and lived in several towns in Oklahoma and Texas. Young Woody often had to work instead of attending school because his family was poor. STEVE EMBER: The first musical instrument Woody learned to play was the harmonica. He learned to play the harmonica by watching an old man play the instrument. Woody learned how to play the guitar by watching his father’s brother play. 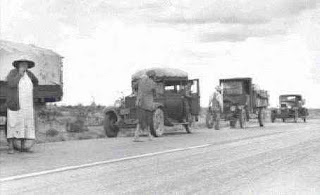 In the nineteen twenties, Woody was living in the town of Pampa, Texas. 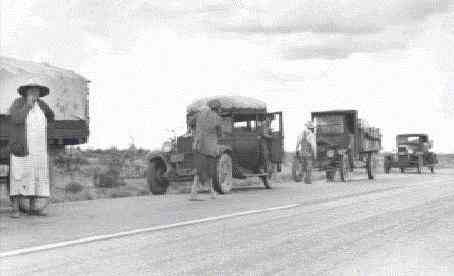 Pampa was known as a “boom town” because it had grown quickly after oil was discovered nearby. MARY TILLOTSON: Woody liked to communicate with other people through his music. Yet he did not like to say much about himself. One reason for this was that he did not want people to know that his mother was in a hospital for insane people. Nora Guthrie suffered from a disease that destroys the brain and nervous system. He was seventeen years old when his mother died, in nineteen twenty-nine. That was the year when the economy of the United States began to slow down. Over the next several years, many Americans lost their jobs. The period became known as the Great Depression. In Pampa, the oil fields dried up. Farms in many areas failed because little or no rain fell for several years. The land became so dry that wind easily blew away the top soil. These areas of Texas, Oklahoma and other states became known as the Dust Bowl. STEVE EMBER: Like many other people, Woody Guthrie left Pampa to travel around Texas and the Southwest looking for work. He often made trips by train. But because he had no money, he would jump on the train’s boxcars and ride for free. This was often dangerous, because guards on the train would throw the men off or arrest them. However, Woody found this life exciting. One of the first songs he wrote was about leaving home and fleeing the Dust Bowl. MARY TILLOTSON: In nineteen thirty-eight, Woody Guthrie left the radio program to travel around California. He found that conditions had become worse for many people who had lost their land and fled the Dust Bowl. STEVE EMBER: The oppression and bad conditions in the workers’ camps made Woody Guthrie angry. He began helping labor organizers establish unions to help the workers. Next week, we tell about how he traveled to New York City and became a well-known musician. MARY TILLOTSON: This Special English program was written by Shelley Gollust. It was produced by Paul Thompson. I’m Mary Tillotson. 1. The first musical instrument Woody Guthrie learned to play was the___________________ . 2. During the Great Depression, states like Texas and Oklahoma became known as the "__________________". 3. Woody Guthrie mostly liked to play songs because _____________________ . 4. The song "It's Been Good to Know You" is about ______________________ . 5. 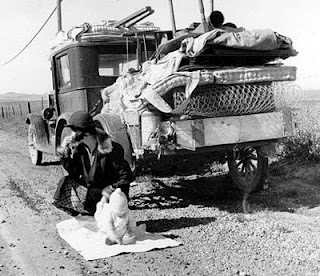 In the 1920s, oil was discovered near where the Guthrie family lived, in Pampa, Texas __________________________ . 6. Woody Guthrie didn't write songs about ________________________ . 7. Riding in box cars was dangerous, exciting, and ____________________ . 8. Farm owners who hired the dust bowl refugees _______________________ . 9. Reading this article, you definitely get the feeling that Woody Guthrie _______________________ . 10. Woody's ___________________ sang him songs when he was and inspired him to be a singer.